Today I was in Pet Smart, shopping for some cat-related goods. 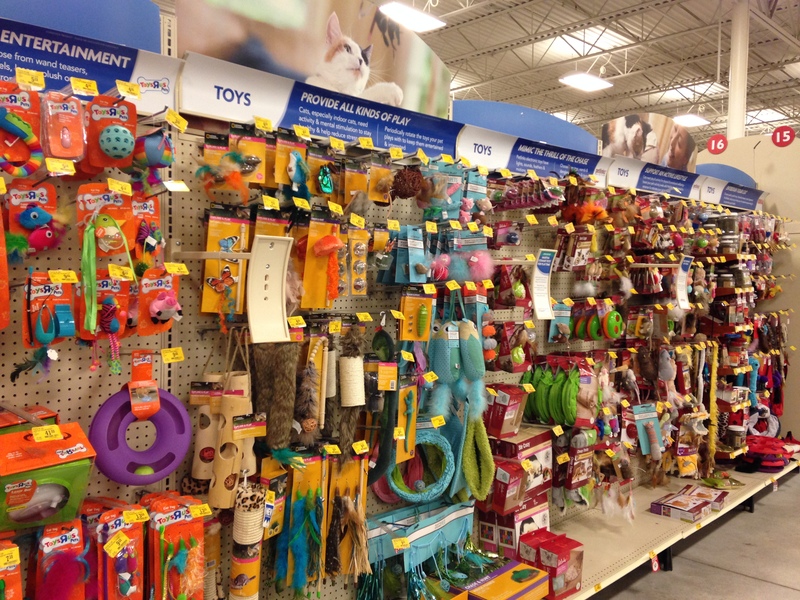 The whole existence of Pet Smart is amazing in itself—the plethora of products, brands, and highly styled goods for pets who themselves could not care less about brands and styles. It goes without saying that most pet products are really about us and not them. For a while, I’ve been meaning to read this book about America’s pet obsession—Michael Schaffer, One Nation Under Dog—which looks very interesting even though it marginalizes cats by focusing on dogs (as do so many smaller pet stores, BTW, the proliferation of internet cat videos notwithstanding). But I digress. 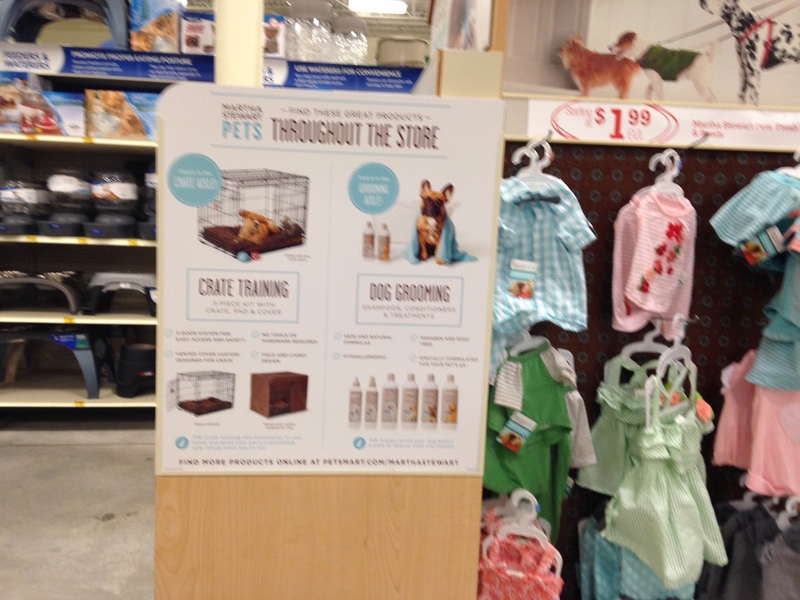 The consumerization of pet ownership (stewardship)? is writ large in the big box pet style. 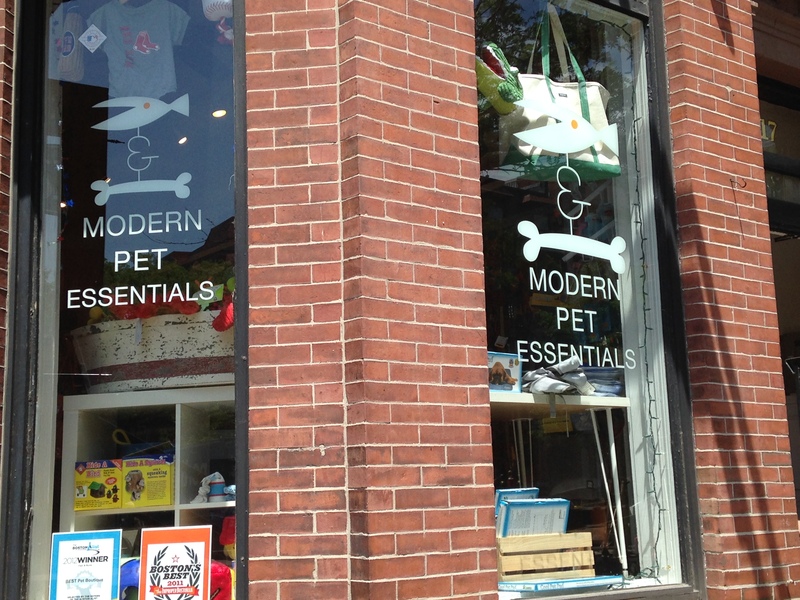 Most intriguing to me on my recent trip were displays that presented pets’ needs as parallel to human needs (and culturally created human needs), thus justifying the branded goods the store was marketing to us. 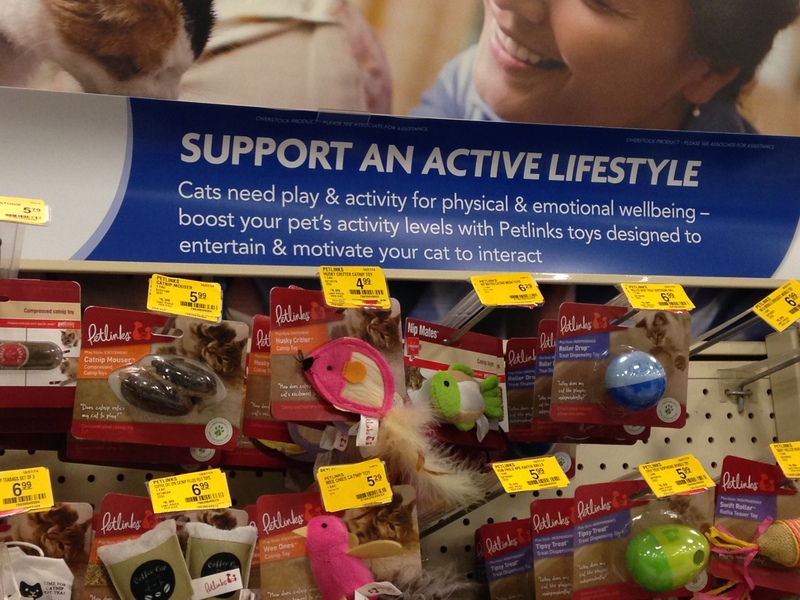 To whit: a display of toys exhorting shoppers to “support an active lifestyle.” Do pets have a “lifestyle?” Isn’t that an inherently human—and brand-driven—concept? not to mention, of course, that most of these toys, though perhaps momentarily appealing to a pet, serve needs just as well met by the errant aluminum foil ball, packaging material, ipod wire, amazon box, or other random household good. Having made that observation, I went ahead and purchased a new hanging sisal scratch toy for my interior garage door. With catnip pocket. Also important: Having your pet be fashion forward. 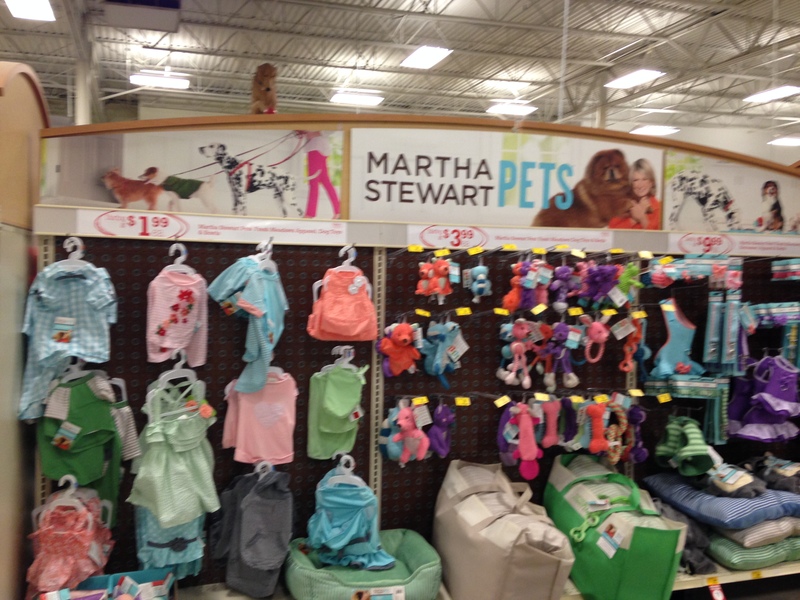 Martha Stewart obliges with a line of dog clothes. 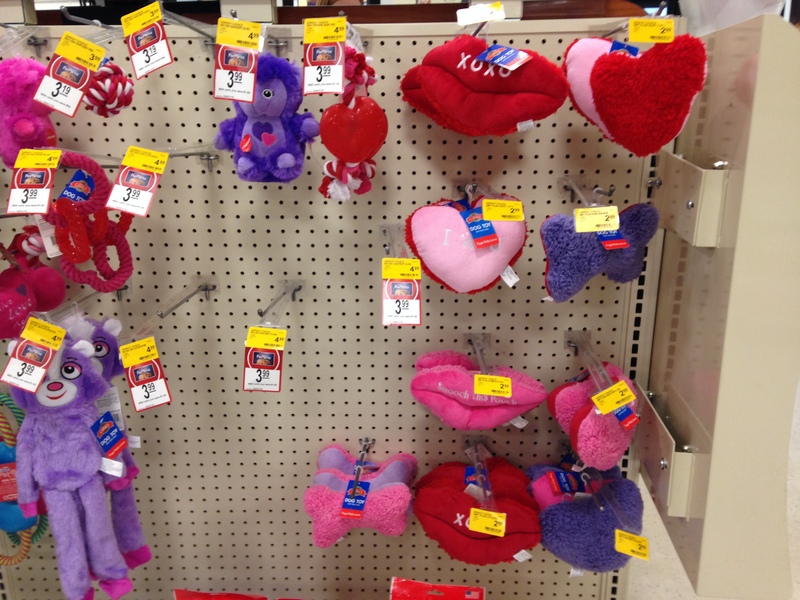 And don’t forget Valentine’s Day—for your prized non-human companion or for the pet-lover in your life.